Last night i was watching TLC Channel and there i saw many types of cheese recipes. And my mouth was watering but i had finished my dinner there was no place in my stomach to make and eat anything.. Then i decided i should make something with cheese tomorrow for breakfast or lunch. Then i made this very simple cheese paratha for my lunch, and it was very yummy. After i finished my paratha i called up to my hubby and said the cheese paratha was so yummy and i finished everything, and he said, i want to eat the same paratha on sunday breakfast. He made my work so easy, now i don't need to spend my energy for thinking, what to make on this sunday breakfast.... 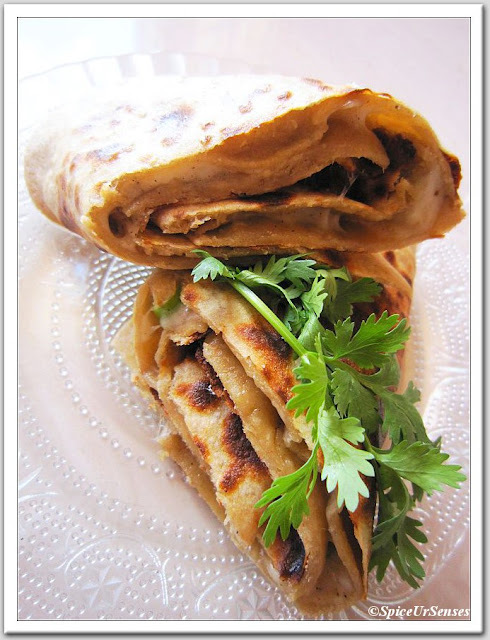 Here is the recipe for cheese paratha. Prepare dough like you would for chapati. 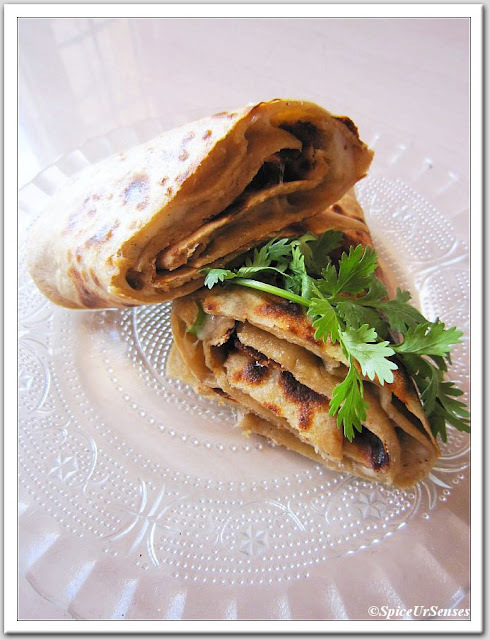 Roll out 2 medium sized thick chapatis. Take 4-6 tablespoons of the filling and spread on one of the rotis. Take the second roti and stick it on top of the first roti that has the filling. Heat tava and place your roti. Let cook on medium heat until browned. Repeat the same with the other side. Apply oil or butter while cooking. Make sure not to flip the roti many times as the filling may spill out. Serve hot with Tomato Sauce. The more adventurous ones could try adding finely diced vegetables with some extra spices. Boiled. shredded chicken, scrambled egg should also taste good with the above mixture. Sooo cheesy and delicious paratha...can guess how tasty these parathas are..
tempting pics, i make this often as my d is a very happy cheese eater !! so tempting paratha !! lovely !! So flaky and tasty .. my kids would love it for sure. That looks and sounds really delicious...yum. Cheese parathas look yummy. Thank you for sharing such a great recipe. Rich and indulgent... Great treat indeed.. I feel hungry reading this! Mouthwatering! 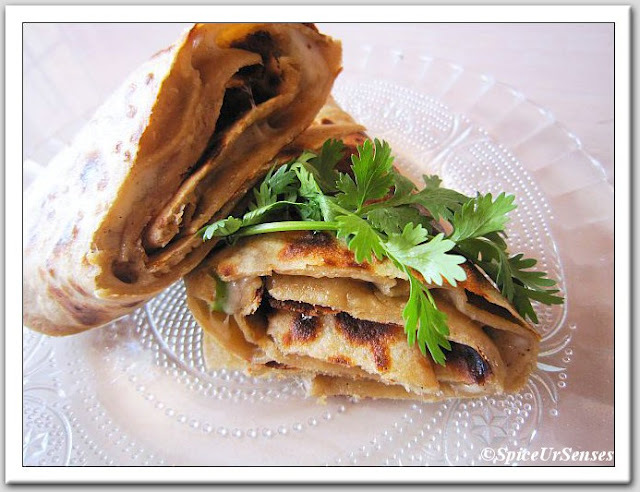 Cheese paratha looks dleicious and nice easy recipe. It looks so delicious..Great idea, Rumana.. I too love cheese parathas a lot Rumana. Amazing clicks. Loved the Cheese Parathas..and lovely clicks.. 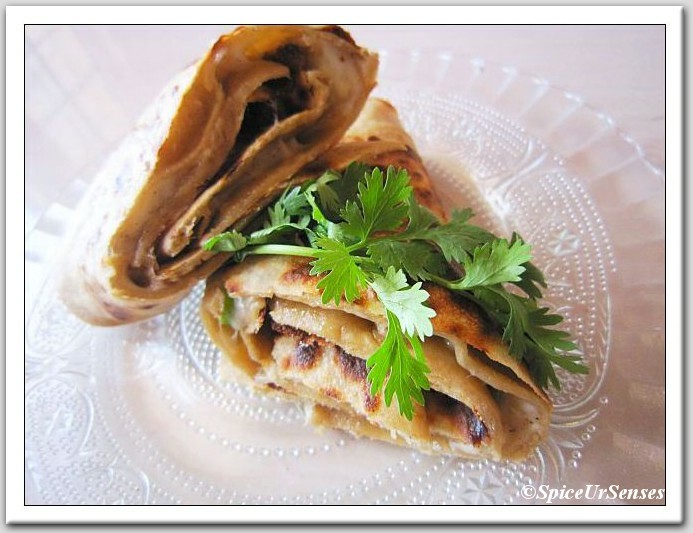 Cheese paratha looks wonderful, delicious and tempting. Lovely presentation. Cheese paratha looks and sounds great! Wish to try out! MAkes me feel hungry! lovely parathas.. tempting me a lot. My daughter fav paratha..looks delicious!! these look and sound cheesy-licious. Very different one.... Nice recipe to try... Looks so good... YUM! Yummy! Almost like a quesadilla! Yummy, it's making me hungry! This's such a brilliant idea ! Loved how you made it look like a wrap -- looks ever more irresistible! I've never had cheese with paratha before! Looks fantastic! Yummy cheese paratha,looks so tasty and delicious.Great idea.